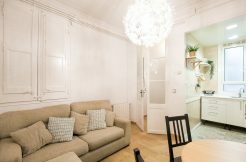 Flat in rent located in the heart of Barcelona in the district of Eixample Izquierda. It’s well served between Hospital Clinic metro station (L5) and Diagonal metro station (L3, L5). As you will understand, you won’t have problem to move in Barcelona and you will discover these secrets. Located in the economic heart of Barcelona, you have access to a lot of avenues with shops and different restaurants (traditional food, fast-food…). There is a supermarket next to the apartment too. The apartment of 77m2 is situated in the second floor with elevator. It’s composed with three bedrooms whose one double bedroom, one simple bedroom and one with two simple beds. The living-room is furnished with sofa, table for lunch, TV. 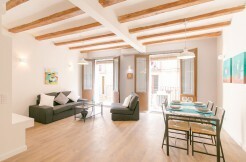 The flat is equipped with heating, air conditioning and has access to Internet. The bathroom is composed with a shower and toilets. The kitchen is fully equipped with dishwasher, washing machine, oven, microwave, fridge, gas burner and all the utensils you will need. Have a great sunny week!